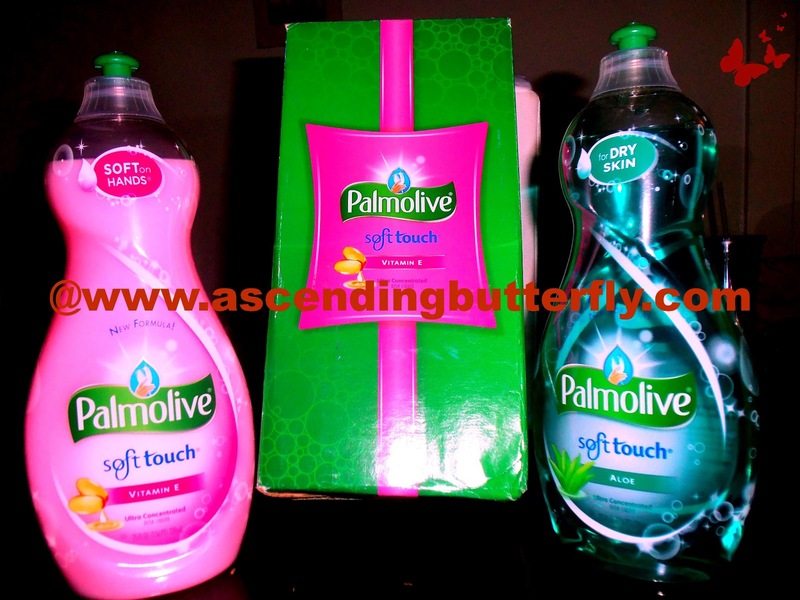 Ascending Butterfly: Have you tried the Ultra Palmolive Soft Touch with Vitamin E or the Soft Touch with Aloe yet? Have you tried the Ultra Palmolive Soft Touch with Vitamin E or the Soft Touch with Aloe yet? While City living has it's perks, one of the major drawbacks about Apartments in my city is that they are super small, most appliances are outdated or worse still there just isn't enough space to have every appliance in a kitchen that is already severely cramped for space as it is. One of the things I have had to do without is a dishwasher. It's an appliance I'd love to have don't get me wrong, there just really isn't anywhere to put it, basically it's a washing machine or a dishwasher and I opted for the washing machine leaving me to wash dishes by hand. Day after Day. Month after Month. Week after Week. Year after Year. Monotonous Much? So you now know exactly why I never get jazzed about Manicures or painting my nails, all that work or money spent and they aren't going to last long with my hands in water all the time. Another negative about dish washing is just how dry it leaves your hands feeling when you are done! And that's where Influenster comes to the rescue, I received another box of love from my friends at Influenster. This one was actually too big for my mailbox, and when I got the slip to pick it up at the post office, I wasn't expecting just how heavy the package would be! And if the box didn't have a big ole clue I would have been wondering all the way to the train station what it was as I picked it up on the run on my way to an event in the City. Let's face it butterflies, into everyone's day Chores must fall. Just because we don't want to do something doesn't mean we can get away with avoiding it. I for one can't leave dishes in the sink overnight, actually I can't leave them between meals either, I'm a dirty a dish, clean it as soon as you are done kind of girl. And while I don't find doing the dishes fun in the least, I make the best of it with my music on, and now I have a new solution for the dreaded 'dishpan hands' syndrome. While Influenster intended me to share by sending me two, I will admit to a very much not like me bout of temporary dishes selfishness! I kept both of them to myself! And much like real 'twins' I am actually hard pressed to pick a favorite from the bunch! They both get my dishes clean and don't dry out my hands which makes me super happy! I'm not going to tell you they make dishes less of a chore, but they sure don't leave you with 'dishpan' hands! I still have a favorite moisturizer on my sink because I love putting on a skin oil or moisturizer when my skin is still damp, but on days when I'm in a rush or forget to put on the additional moisturizer my hands are still soft! You know I love to do my research and keep track of ways to keep things Green, so for those of you thinking 'butterfly, I like the idea of Palmolive but I have an all Eco Kitchen, can I still use Palmolive? ', the answer dear butterflies is a resounding YES! If you are all Eco, all the time, then Palmolive Eco + Lemon Splash may be better for you! For fellow Influenster Members who say they never get picked, don't give up, keep being your fab and social self, because sometimes I go months and months between Influenster boxes, and then some months you get surprised with TWO boxes in the same month! BAM! SCORE! FTC Disclosure: Ascending Butterfly was provided with product samples for editorial consideration, all opinions are 100% my own. I am an Influenster Member, however this is a non-compensated product review. That pink Ultra Palmolive Soft Touch Vitamin E is one of my favorites. I've been along time user of Palmolive,but it's good to know that they are updating there product, I for one will try the new versions out first Palmolive Soft Touch Vitamin E ,then the rest.